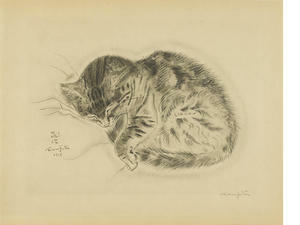 At Bonhams Los Angeles earlier this week, Michael Joseph and Tsuguharu Foujita’s A Book of Cats reached $77,500, beating a previous Bonhams auction record. The 1930 book features the prose poetry of Joseph as a complement to the illustrations of Foujita, considered one of the most important and eccentric Japanese artists working in the West during the early twentieth century. The book contains twenty full-page etched plates, plus an additional suite of twenty loose etched plates on Japanese vellum. Though a scarce edition--only five hundred copies of this signed/limited edition were printed--the book often appears at auction. Last year, it just made the top 500 (by price) rare books list when it sold in December at Bonhams for $68,750. Before that, Bonhams sold one in June of 2011 for $61,000 and in June of 2012 for $74,500. At Bonhams Los Angeles earlier this week, Michael Joseph and Tsuguharu Foujita's A Book of Cats reached $77,500, beating a previous Bonhams auction record. The 1930 book features the prose poetry of Joseph as a complement to the illustrations of Foujita, considered one of the most important and eccentric Japanese artists working in the West during the early twentieth century. The book contains twenty full-page etched plates, plus an additional suite of twenty loose etched plates on Japanese vellum.